Harriet Tubman, ca. 1860–1875. Photo: Library of Congress. Few may remember the rather juvenile comments objecting to the announcement on April 20, 2016 by the Department of the U.S. Treasury that Harriet Tubman (ca. 1822–1913) would front the new $20 currency, set to debut in 2020. Imagine this issue of beauty was such a concern that a few well-meaning African Americans on the Internet began circulating an image that was preferred for the new $20 design, mislabeled “Young Harriet Tubman” (Fig. 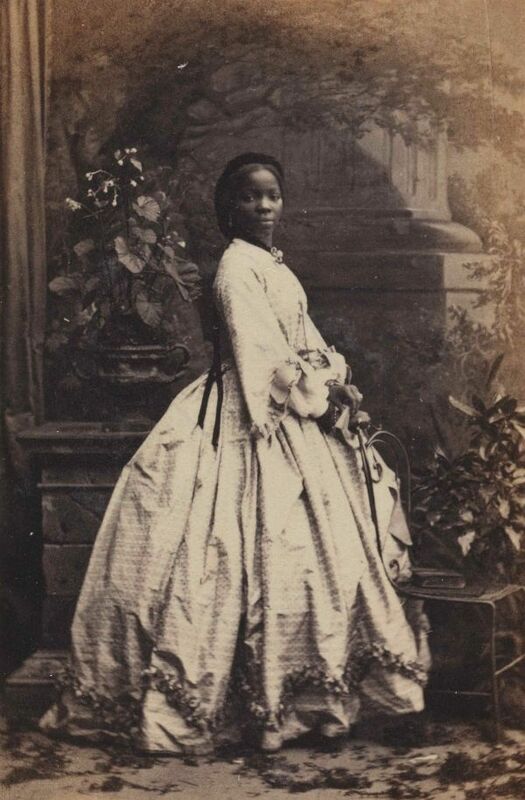 1), which was actually a portrait of the West African aristocrat Sarah Forbes Bonetta (1843–1880), who had the interesting position of goddaughter to Queen Victoria. Almost as if to assuage our contemporary 21st-century audiences who have been sold on the virtues of black beauty, Harriet Tubman has now resurfaced this Black History Month in a newly discovered photo (Fig. 2) from an album once owned by Tubman’s friend and fellow abolitionist Emily Howland. The new image is being auctioned by New York’s Swann Galleries on March 30, 2017. Fig. 1: Sarah Forbes Bonetta, mislabeled as “Young Harriet Tubman.” Photo: Buzzfeed. Fig. 2: Newly discovered photo of young Harriet Tubman. Photo: Swann Galleries. Indeed, this authentic “Young Harriet Tubman” has arrived just in the nick of time, it seems. According to Larson, she may have been around 43 to 46 years old in this carte-de-visite, just at the end of the Civil War. 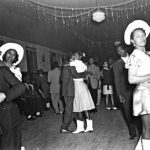 This photograph was taken just as she was poised to live a full life in freedom, with her Underground Railroad and war years behind her. She was also on the cusp of marrying a considerably younger man. This is a portrait of “get your life” Harriet Tubman on the verge of focusing on self-care, domestic life, and heading a full household of relatives and ex-slaves. Her engagement with photography also reveals her interest in self-fashioning her image and identity, much like her contemporaries Sojourner Truth (1797–1883) and Frederick Douglass (1815–1895), who all participated in what Darcy Grimaldo Grigsby calls the “liberatory power of modernization” represented by the recent invention of photography. Tubman has suddenly taken on new popularity in today’s culture—not just in her selection last year for the $20 currency, which culminated in a year-long campaign begun in 2015 when she won the popular vote for the Women on the 20 competition, but also in her cameo appearance on the finale of the first season of WGN’s television series Underground, or in a satirical rendering by Octavia Spencer in Comedy Central’s Drunk History. Two biopic films are currently underway, including an HBO film produced by and starring Viola Davis based on Larson’s biography, and another film tentatively titled “Harriet,” which is set to star Broadway sensation Cynthia Erivo. It will be interesting to see how these films redress Tubman’s heroic portrait. She is often characterized as an elderly “Aunt Harriet” or “Mother Tubman,” or the flip side, as a strong black superwoman, a veritable gun-toting action hero, by the looks of how her characterization will evolve in Underground‘s second season. The new photograph disrupts these iconic representations. More importantly, it reveals a woman more than an icon. 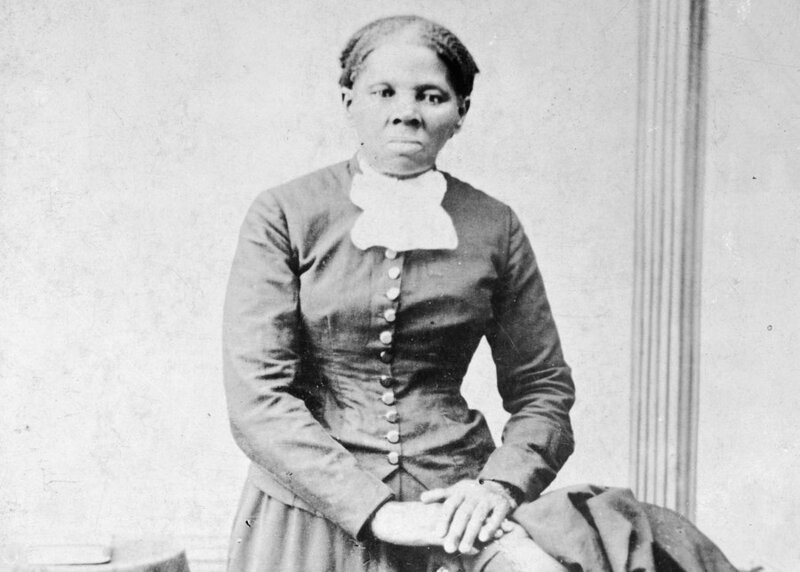 Harriet Tubman was thin and petite, only five feet tall, an interesting figure we don’t often imagine when we think of the iconic strong black woman leading her ban of fugitives, threatening them with her pistol in hand whenever they grew weary on the journey to freedom. The new photograph depicts a feminized and elegant Harriet Tubman interested in her looks. Her mixing and matching of a dark top with a lighter-colored hoop skirt shows an innovative fashion style, along with her carefully parted and braided hairstyle. Sojourner Truth may be the one with the powerful oral delivery, who has been frozen in time forever asking on behalf of a collective black womanhood, “Ain’t I a Woman?”1 Harriet Tubman’s new photograph answers in the affirmative, however, even as her heroic actions redefine what such womanhood entails: leadership, resistance, and community-building. With this new image—which further contextualizes her more iconic photograph from 1868 (Fig. 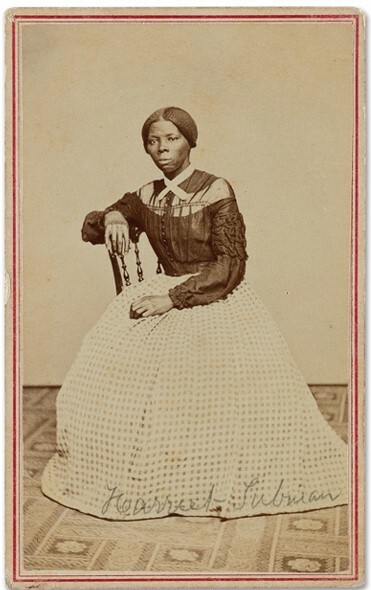 3), in which she stands erect while placing her hands on a rollback chair, her parlor-like surroundings suggesting her readiness to take on the full bourgeois citizenship promised African Americans—we can assess Tubman’s photographic subjectivity as she participates in her own image-making and iconic reconstruction. 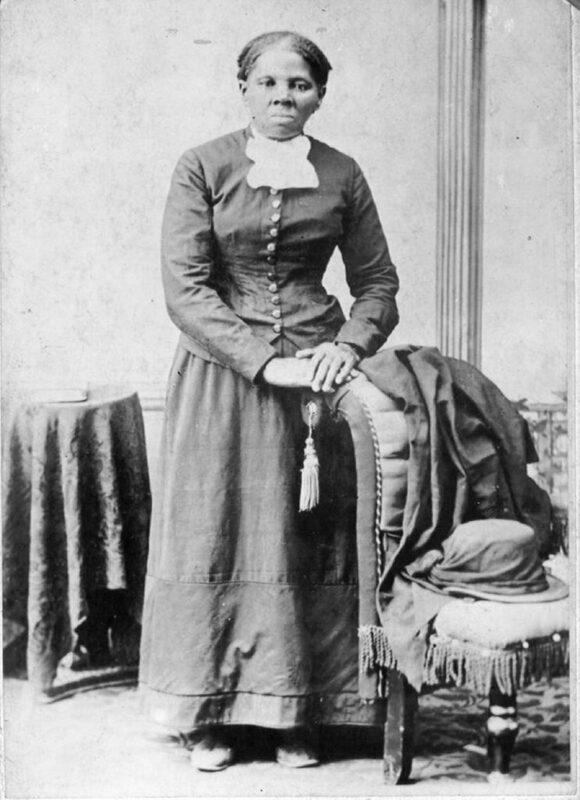 Already at work to raise funds for her growing household at the time these photos were taken—in the wake of being denied a veteran’s pension for her work during the Civil War because she was a woman (unlike her fellow black male spies who were paid)—Tubman attempted to secure her own heroic legacy while simultaneously fighting poverty. Fig. 3: Harriet Tubman. Photo: Smithsonian Magazine. 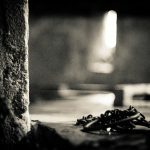 It is precisely because of her willful participation in storytelling and self-fashioned imagery that our interpretations of Tubman’s representations need careful nuance. When Internet users mistook Sarah Forbes Bonetta for a “young Harriet Tubman,” I thought of the incongruity of celebrating an image of the colonized African girl (Bonetta was 19 years old at the time of her portrait) over the self-emancipated free black subject that Tubman obviously represented. Then again, even I have to challenge this dichotomous construction between two black historical figures, given the minimal degrees of separation between Bonetta and Tubman. Bonetta’s close relationship with Queen Victoria is not too dissimilar from Tubman’s own correspondence with the queen, who—after being “pleased with” Tubman’s biography—had sent her a silk and linen shawl as well as a silver medal commemorating her Diamond Jubilee in 1897 and in honor of her delivery of slaves to freedom in Canada.2 The shawl now hangs in the National Museum of African American History and Culture, while the medal was buried with Tubman. Such interlocking histories obviously require transnational critiques that interrogate how we construct “colonized” versus “liberated” subjects. These photographic portraits now complicate the historical subject, and we are ever required to dig beyond the iconic, to “give blood to the scraps,” as Toni Morrison once wrote in Beloved. 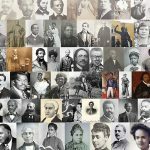 Now that Tubman has manifested in a younger portrait at this particular moment when her legacy is simultaneously under threat (with a presidential administration championing Andrew Jackson and undermining human rights) and poised to take center stage in our popular culture, we must ever be ready to change the historical narrative. 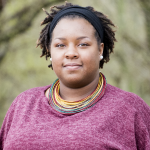 Janell Hobson is an Associate Professor of Women’s, Gender, and Sexuality Studies at the University at Albany, State University of New York. She is the author of Venus in the Dark: Blackness and Beauty in Popular Culture (Routledge, 2005, 2nd ed. 2018) and Body as Evidence: Mediating Race, Globalizing Gender (SUNY Press, 2012). She also writes and blogs for Ms. Magazine. Follow her on Twitter@JProfessor.